Note: This page is available only if you are a realm admin and realm-specific encryption keys are enabled for your realm. For more information about enabling this feature for your realm, or if you have additional questions, contact your customer service manager or sales account executive. Realm admins can manage data security features of their realm. Quick Base protects and encrypts customer data. Quick Base protects data at rest using envelope encryption with AES-256 encryption keys. Each app receives a unique data key, which is used to encrypt the app and its data at rest. The master key is then used to encrypt the data key. Quick Base never stores unencrypted data to disk. Quick Base encrypts data in transit using SSL/TLS. By default, Quick Base uses a global master key, which is shared among multiple realms and never leaves the key management service (KMS). For additional control over your keys, you can request your own realm-specific master key. To request a realm-specific master key, contact Quick Base Support and open a support ticket. 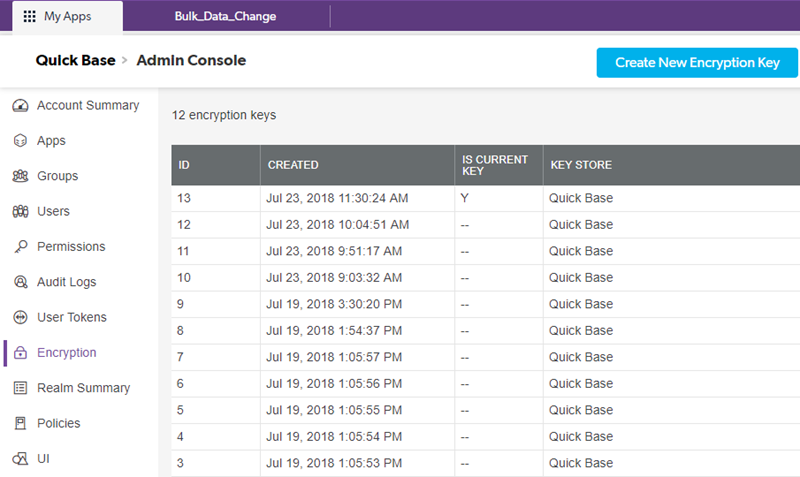 Quick Base allows you to bring your own encryption key (BYOK) that’s hosted in your AWS Key Management System (KMS). To use your own key, contact Quick Base Support and open a support ticket. If realm-specific master keys are enabled for your realm, click Encryption to open the Encryption page. To rotate your master key to replace it with a new master key, click Create New Encryption Key. Quick Base updates the table to show your new key as the current master key.